In October of every year amongst the colour and stunning landscapes of Nova Scotia, Canada, artists from all over the globe come together for a music festival that has become one of the country’s premier events. Cape Breton Island plays host to nine days of concerts, community events, and a Festival Club every night. Since the festival’s first outing in 1997, it has won national and international tourism awards and has successfully extended the region’s tourism season well past just the summer months. Celtic Colours has welcomed artists from Ireland, Scotland, England, Wales, Spain, Brittany, along with Nordic countries, and even Cuba. They are joined, of course, by more local artists from Canada and the USA to make the festival a melting pot of cultures, styles, and fun. First settled by French, Irish, and Scottish immigrants, the people of Cape Breton have held fast to the cultural identities they brought with them while also assimilating that of the native indigenous people, the Mi’Kmaq. No doubt the island’s remote location and relative isolation helped in cementing a tradition of music and dance that is still practised. In celebrating those roots, the whole island is utilised for hosting the festival, with public buildings and venues being repurposed to accommodate workshops and concerts. 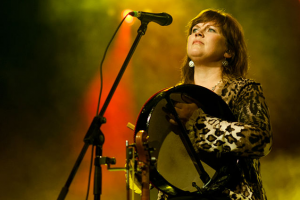 Celtic Colours’ strength is that it is truly a community festival. Despite its size and small populations, Cape Breton produces an amazing number of home-grown artists to play in the festival. From solo artists to family bands, and even a choral group with over fifty singers, the island’s talent pool is deeper than one could imagine. That line-up is complemented by international artists that include pipers and harpists from Scotland and fiddle players from the USA and Russia. There could be as many as six concerts a day in the festival’s programme, so making a plan of which ones to attend can be a daunting task. Whether it’s local dance or the unique Cape Breton style of fiddle playing, traditional Gaelic singing or bagpipers, the scope is wide. 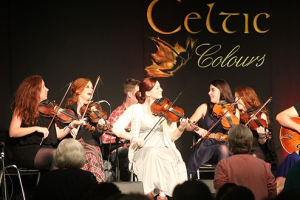 And should any of the concerts awake a lust for more knowledge about the craft, Celtic Colours cannily provides workshops and community events in which attendees can immerse themselves in the art and its culture. As the festival is so intimately related to the local population, it only makes sense that it be a large part of making it a success. Festival goers are invited to attend the workshops, lectures, walking tours, art exhibitions, and communal meals that add great depth to the cultural experience. At what other festival can you be taught how to square dance in the morning, then go learn how to cook local food in the afternoon? Aspiring visual artists can participate in en plein air painting classes, while those with a musical bent can try out new and unusual instruments for size. After a home-cooked meal in the community kitchen and as the concerts end, the Festival Club in St Ann’s Gaelic College opens its doors for a more relaxed musical session. You never know who or what might be playing and with a bar open till 3 a.m., it can be one long, magical session.